As African Americans tried to find their own individuality they needed to define their own culture. The question often lies in where to look? 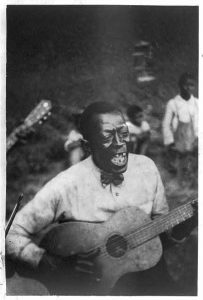 In Blues People Jones and Baraka comment that African American peoples often turned to their African rituals for their roots. However, as generations were born into slavery in the united states, these traditions were intrinsically mixed with the plantation life: brewing a new synthesis culture altogether. Unfortunately, historical documentation is sparse on Wilson. Nevertheless, one could speculate that such a name would give Wilson Jones a figure of prominence and strength in the African American community. 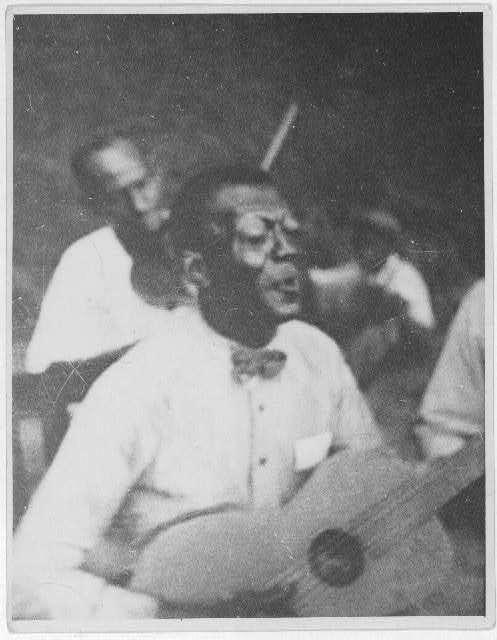 When John Avery Lomax took a series of photographs of Wilson Jones, he simply labeled them all as photos of simply “Stavin Chain,” and were later labeled fully as Wilson Jones. Perhaps this was also an attempt to preserve Wilson Jones’ anonymity. Unfortunately, all too often in history, African American musicians were subject to terrible prejudice, especially if they became a well-known figure in society. Nevertheless, Wilson Jones became “Stavin Chain,” a figure of strength and prominence. This term may refer to the American tradition of arms manufactures in the late 19th century utilizing chains to hold barrel staves together, or perhaps it refers to chains used to bind ankles on chain work gangs (Americanbluesscene.com). I believe that this term could easily have come from a blend of the two stories, as African American folk so heavily relies upon cultural blending. Lomax, A., photographer. (1934) [Stavin’ Chain playing guitar and singing the ballad “Batson,” fiddler also in shot, Lafayette, La]. Lafayette Louisiana United States, 1934. June. [Photograph] Retrieved from the Library of Congress, https://www.loc.gov/item/2007660068/. Lomax, A., photographer. 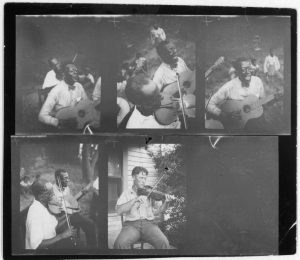 (1934) [Stavin’ Chain playing guitar and singing the ballad “Batson,” Lafayette, La]. Lafayette Louisiana United States, 1934. June. [Photograph] Retrieved from the Library of Congress, https://www.loc.gov/item/2007660069/. Lomax, A., photographer. (1934) [Stavin’ Chain playing guitar and singing the ballad “Batson,” Lafayette, La. fiddler in the background]. Lafayette Louisiana United States, 1934. June. [Photograph] Retrieved from the Library of Congress, https://www.loc.gov/item/2007660070/. Baraka, A., & Harris, W. J. (2000). The LeRoi Jones/Amiri Baraka reader. New York: Thunders Mouth Press. This entry was posted in Uncategorized by carlso2. Bookmark the permalink.